The Third Nakshatra, i.e. Krittika Nakshatra. Sign and Degree – Krittika is the 3rd Nakshatra. It begins at 26.40 degree of Aries and ends at 10 degree Taurus. So, it is the 1st nakshatra which spreads into two signs. Hence, if anyone has any planet in Krittika Nakshatra then we have to see the sign involved as that sign will also have its impact on the functioning of planet in Krittika Nakshatra. As major portion of Krittika falls into Taurus, we can say that it is more impacted by Taurus nature than Aries Nature. Name and its meaning – Krittika word and Critic word has the same root. Also, Krittika literally means "The Cutter" or "The One Who Cuts". This nakshatra is related to the 7 Krittikas or 7 sisters who were wives of 7 Sages. Representation – Its main symbol is An Axe. Its other symbols are also similar like A Razor, A Blade, A Cutter or Any Sharp-Edged Instrument which can incise. 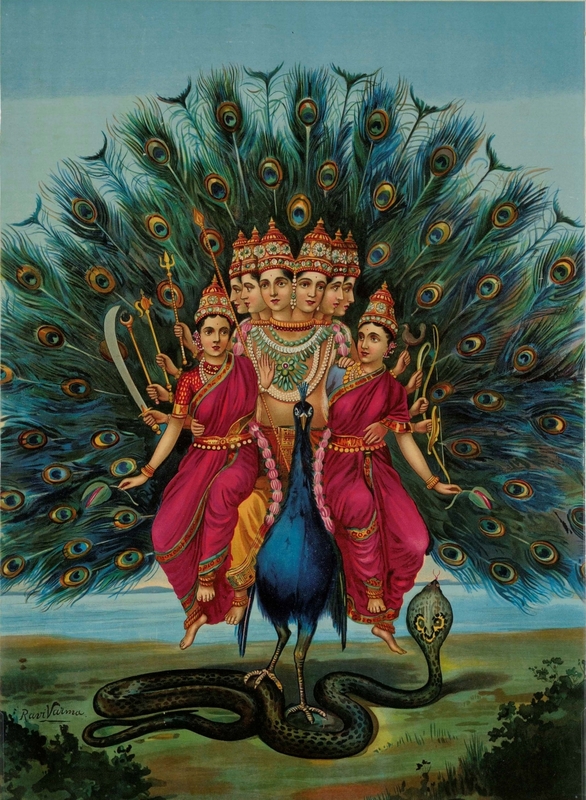 Its picture includes 7 Krittikas or 7 Sisters and a Peacock among other things. Activation Age - Besides dashas and planetary maturity ages, another way of activating a planet is activation age of nakshatra it is sitting in. Krittika Nakshatra activates itself at the ages of 7th, 14th, 21st, 30th, 42nd, 43rd, 47th, 71st, 74th, 77th and 84th year of age. Deity, Nakshatra Lord & Sign Lord – Its Deity is Kartikeya, the Son of Lord Shiva. He is also known as God of Wars or Commander of Godly Forces. Krittika Nakshatra's lord is Sun. Up to 30 degrees Aries, Mars is the sign lord. From 0 degree Taurus to 10 degree Taurus, Venus is the sign lord. Mythological Story – As per ancient story, Gods were losing battle and their territory against Demons. Gods went to Lord Shiva and requested to protect them. Lord Shiva told that he directly cannot do so but he can produce a Son who will take care of Gods' needs. Hence, Kartikeya was born with the soul purpose of fighting the battle on behalf of Gods. But he was just an infant and when Demons came to know about the purpose of Kartikeya's birth, they tried to search him and kill him at the infancy stage itself. Under these circumstances, Kartikeya was given to 7 Krittikas or 7 Sisters who were wives of 7 Sages to take care and protect Kartikeya from any danger. Their job was to bring him up to boyhood so that he can fight the battle against demons and defeat them. In the end, this is what happened in story. As Krittika and Critic have same root, these people can be very good at analytically examining something and criticizing it. They are good at rationalizing things. As Krittika is represented by Razor, Cutter or Blade, it represents weapons and wars. Especially the weapons which have sharp edge. As such, it also represents surgeries and bloodshed. It can also represent someone with a very sharp tongue and who criticizes very bitterly. As Kartikeya was growing up, he got martial training too as he was supposed to fight with Demons. So, Krittika Nakshatra also relates with training of weapons or military. All the above results can be seen more when Krittika is in Aries section because Aries lord is Mars and has similar nature to Krittika. But then comes the other nature of Krittika which is represented by Taurus section. As Taurus is sign of wealth, security and assets, Krittika becomes a nakshatra signifying the need of security or safety. Remember that Kartikeya needed the safety as an infant. As Kartikeya was secretly handed over to 7 Krittika and Demons had to search for him, it becomes a nakshatra of immense danger, secret matters and research & investigation. But most commonly discussed trait of Krittika is Foster Parenting. As 7 Krittika took over the responsibility of taking care of infant Kartikeya who was not their child, this nakshatra is directly related to foster care or adoption. Likewise, it will also relate with Divine Mother's Care which is unselfish by nature. Krittikas didn't care if Kartikeya is their child or not. This is why Moon is exalted here at 3 degree Taurus. Conclusion – So, this is some basic information and interpretation of Krittika Nakshatra.